4 4 What neighbouring countries? 9  1859 – Telecommunications introduced in Sudan: * First telegraph link between Cairo & Sawaken.  1871–1873 Telegraph line reached Khartoum (Small unit for Post & Telegraph).  1892 - 1903 First Telephone exchange in Sudan (Eldaba & Khartoum).  1910 -1971 The service was run by a government body known as Posts & Telegraphs (P&T)  1971 - 1978 Telecommunication was separated from the Post service and run as a governmental Department. 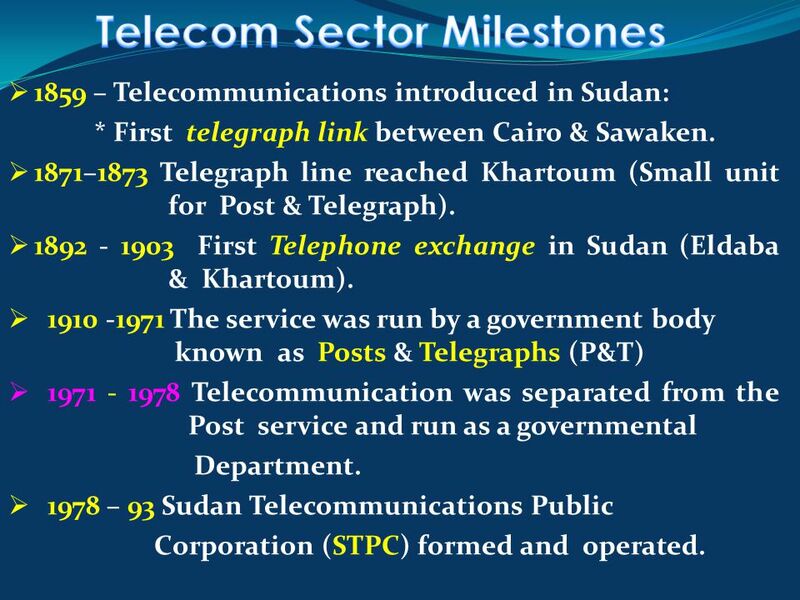  1978 – 93 Sudan Telecommunications Public Corporation (STPC) formed and operated. 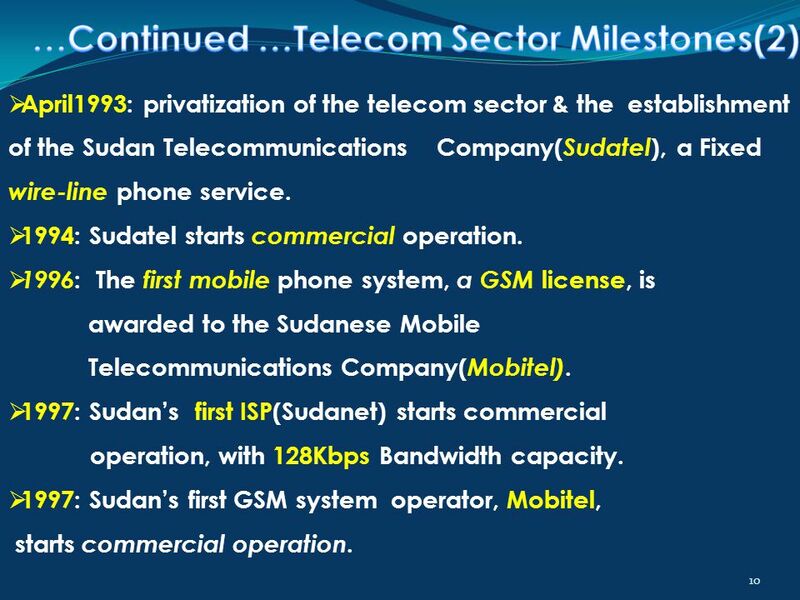 10 10  April1993: privatization of the telecom sector & the establishment of the Sudan Telecommunications Company( Sudatel ), a Fixed wire-line phone service.  1994: Sudatel starts commercial operation.  1996 : The first mobile phone system, a GSM license, is awarded to the Sudanese Mobile Telecommunications Company( Mobitel). 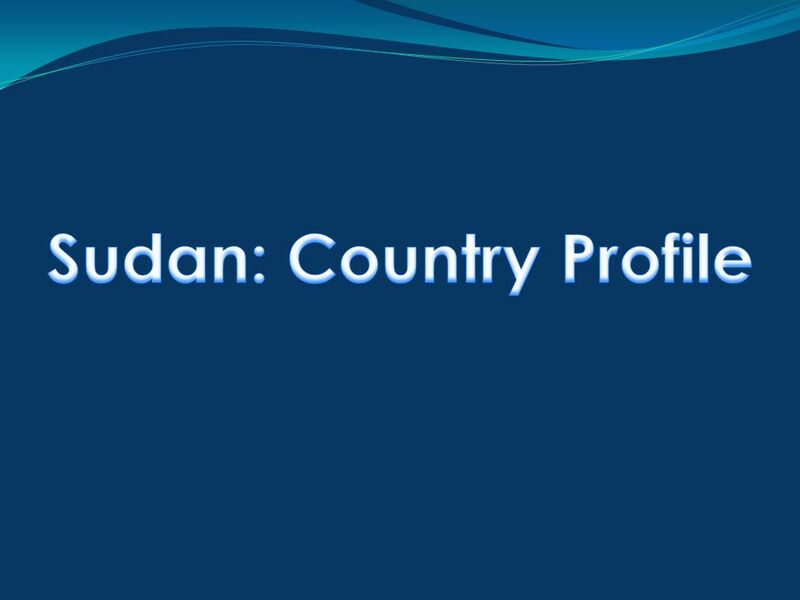  1997: Sudan’s first ISP(Sudanet) starts commercial operation, with 128Kbps Bandwidth capacity.  1997: Sudan’s first GSM system operator, Mobitel, starts commercial operation. 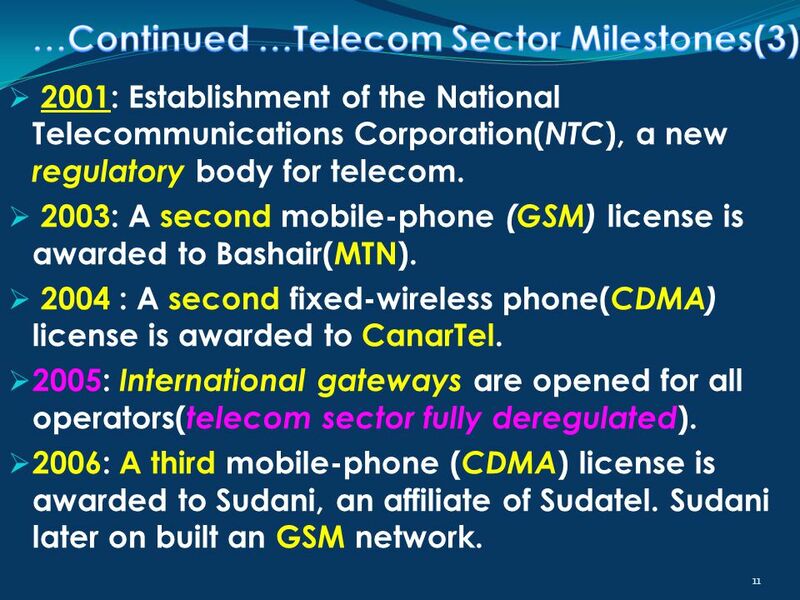 11 11  2001: Establishment of the National Telecommunications Corporation( NTC ), a new regulatory body for telecom.  2003: A second mobile-phone (GSM) license is awarded to Bashair(MTN).  2004 : A second fixed-wireless phone( CDMA) license is awarded to CanarTel. 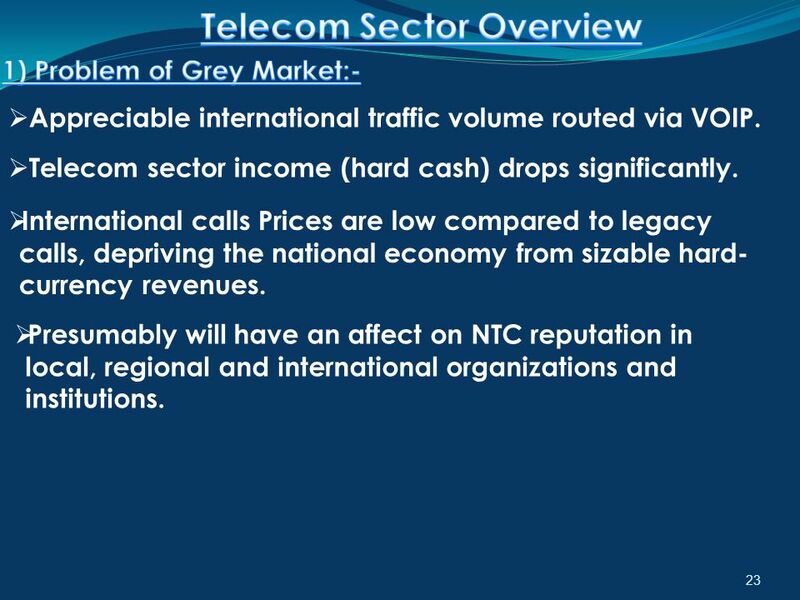  2005: International gateways are opened for all operators( telecom sector fully deregulated ). 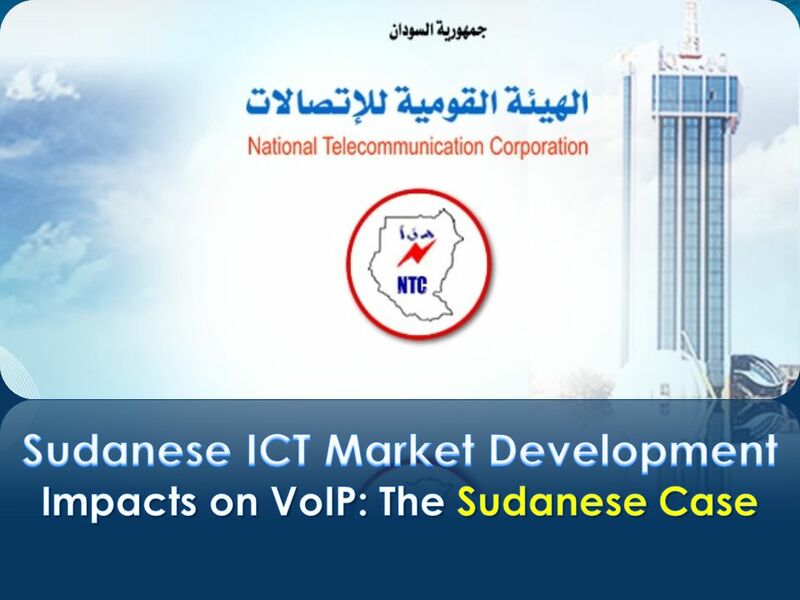  2006: A third mobile-phone ( CDMA ) license is awarded to Sudani, an affiliate of Sudatel. 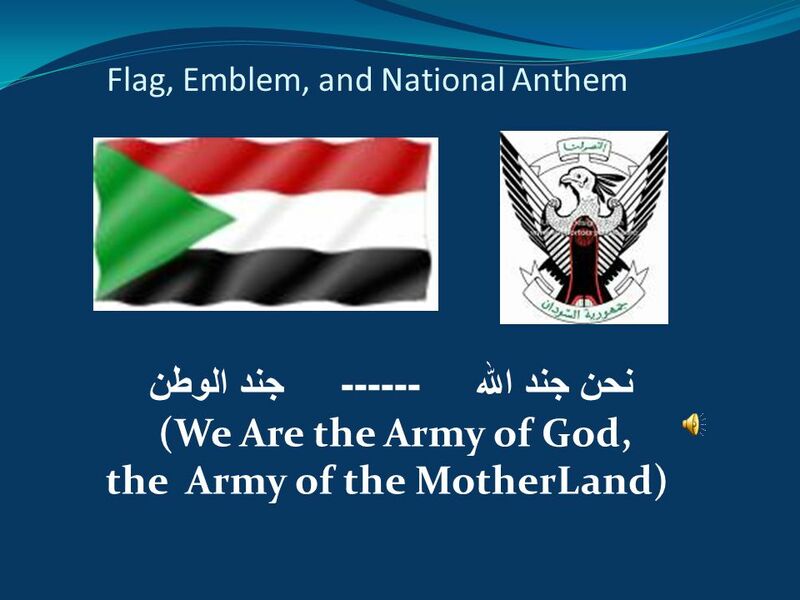 Sudani later on built an GSM network. 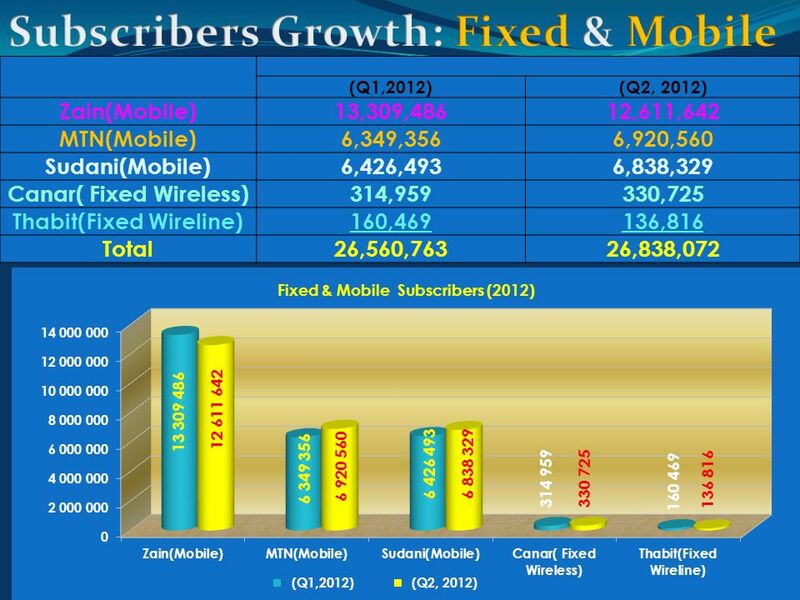 12 12 2) Fixed phone system Subscribers = 467,541. 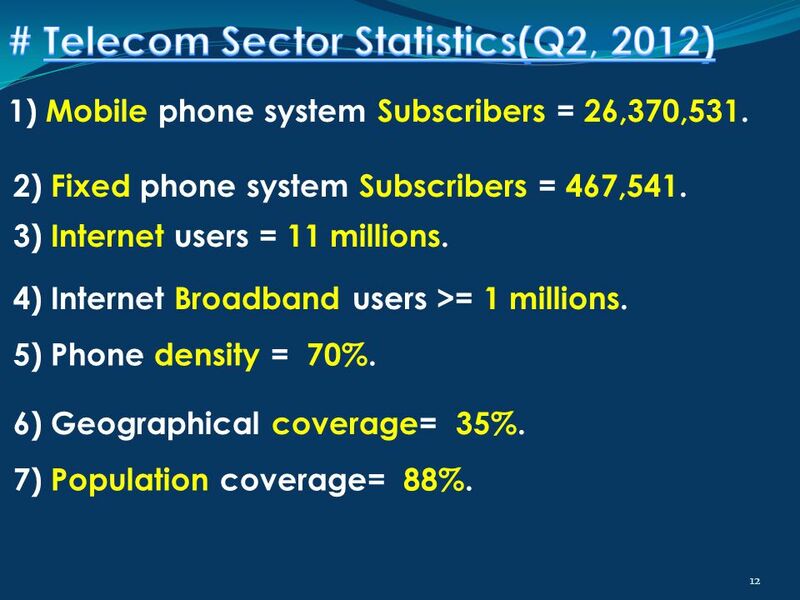 1) Mobile phone system Subscribers = 26,370,531. 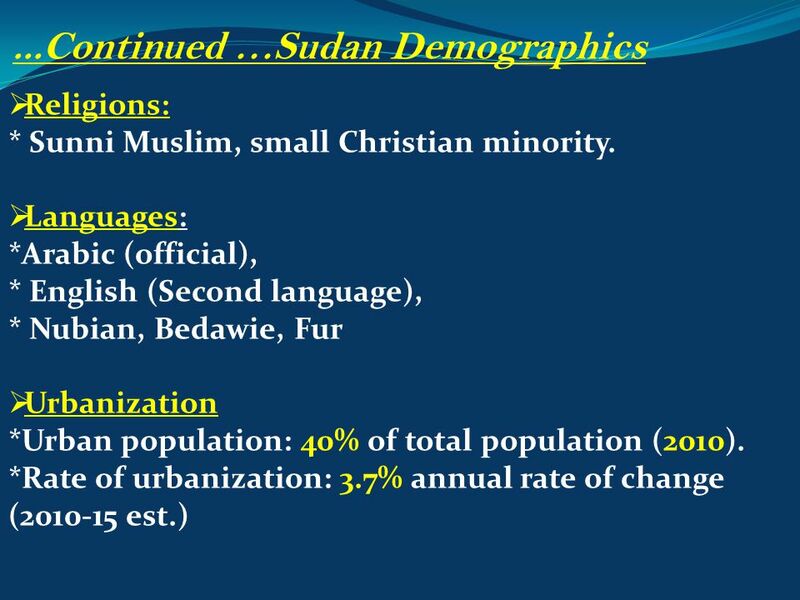 6) Geographical coverage= 35%. 5) Phone density = 70%. 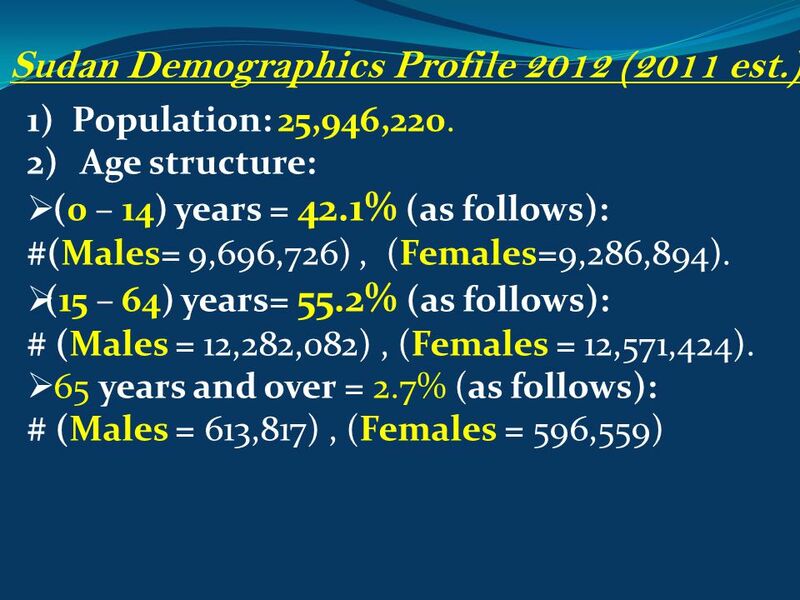 7) Population coverage= 88%. 3) Internet users = 11 millions. 4) Internet Broadband users >= 1 millions. 19 19 Q. 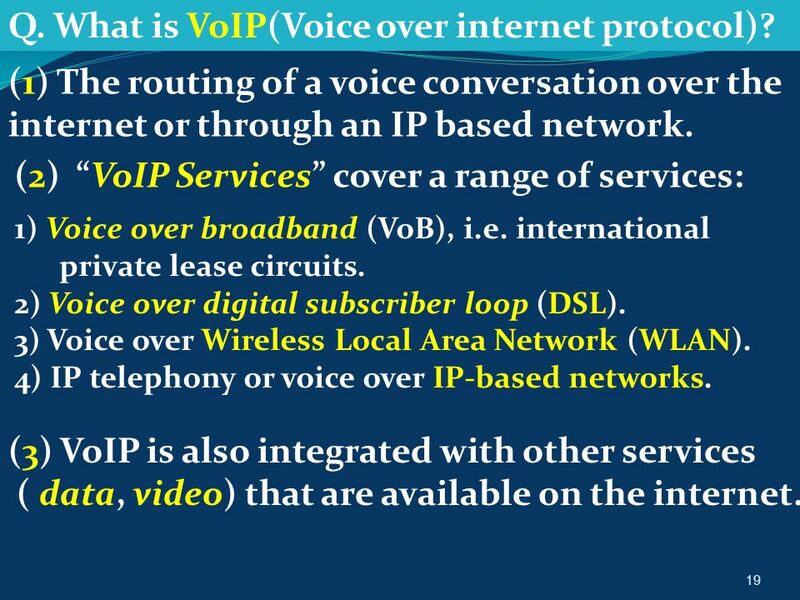 What is VoIP(Voice over internet protocol)? (1) The routing of a voice conversation over the internet or through an IP based network. (2) “VoIP Services” cover a range of services: 1) Voice over broadband (VoB), i.e. international private lease circuits. 2) Voice over digital subscriber loop (DSL). 3) Voice over Wireless Local Area Network (WLAN). 4) IP telephony or voice over IP-based networks. (3) VoIP is also integrated with other services ( data, video) that are available on the internet. 20 20 (1) A number of presentations were given highlighting the Regulatory and Technical aspects of voice over internet protocol(VoIP) at the NTC quarters. 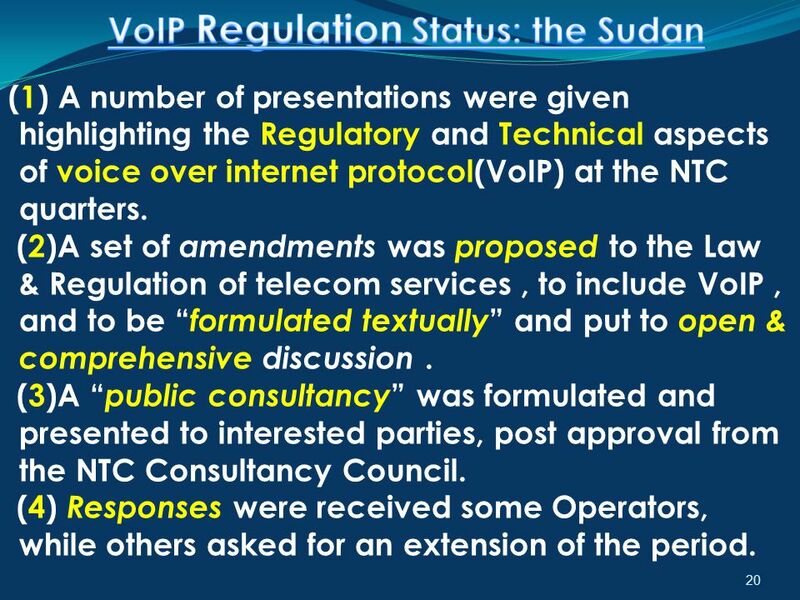 (2)A set of amendments was proposed to the Law & Regulation of telecom services, to include VoIP, and to be “ formulated textually ” and put to open & comprehensive discussion. 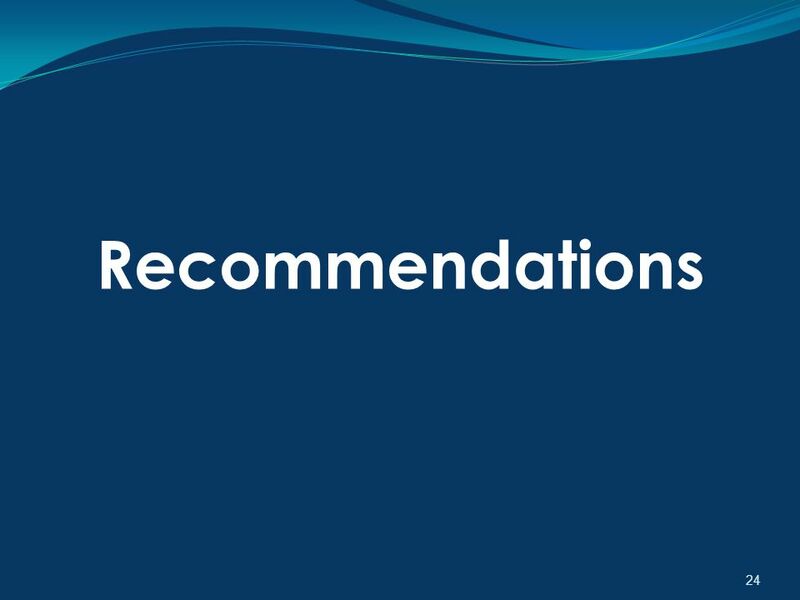 (3)A “ public consultancy ” was formulated and presented to interested parties, post approval from the NTC Consultancy Council. 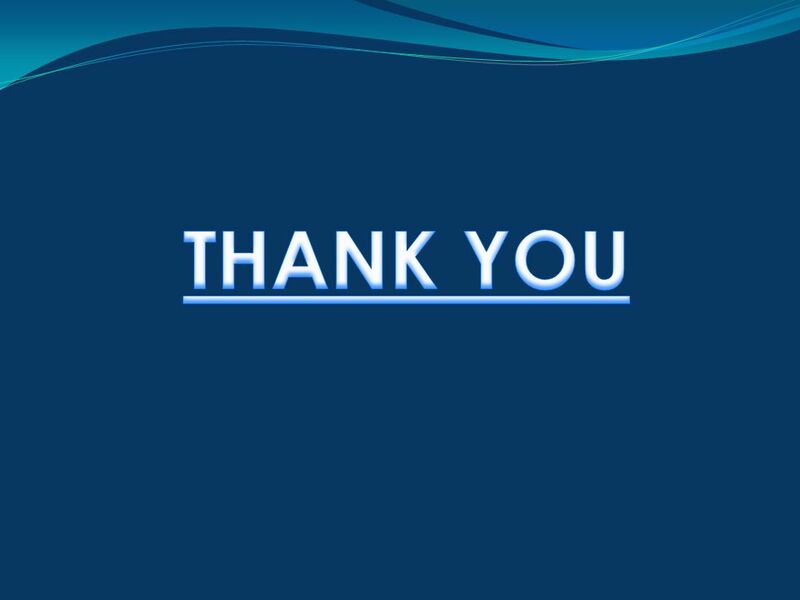 (4) Responses were received some Operators, while others asked for an extension of the period. 21 21 5. Documents Currently available are:-  VoIP Signaling Protocol,  Regulating telephone calls over Internet Protocol  Operators’ Responses.  Public Consultancy “Regulations of telephone-call services over Internet Protocol”(Arabic/English). 22 22  2 Fixed-phone Operators(Sudatel &CanarTel). 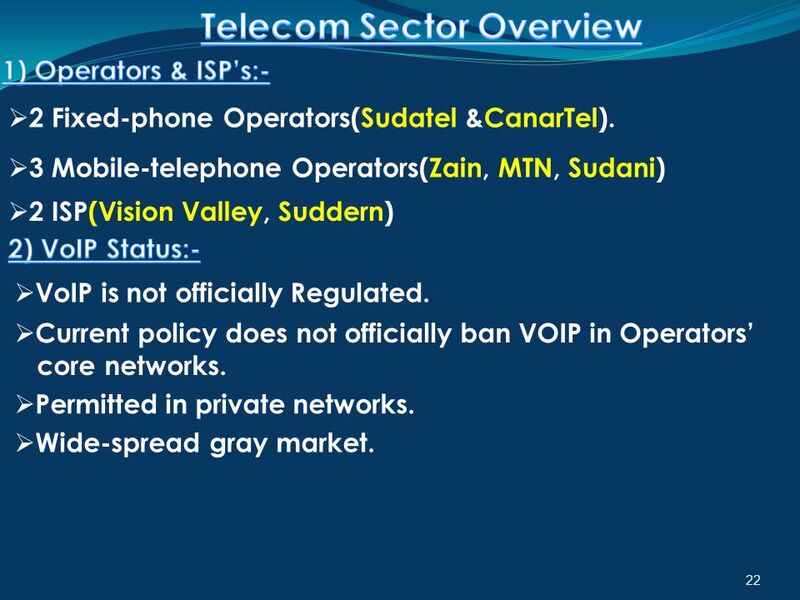  3 Mobile-telephone Operators(Zain, MTN, Sudani)  2 ISP(Vision Valley, Suddern)  VoIP is not officially Regulated. 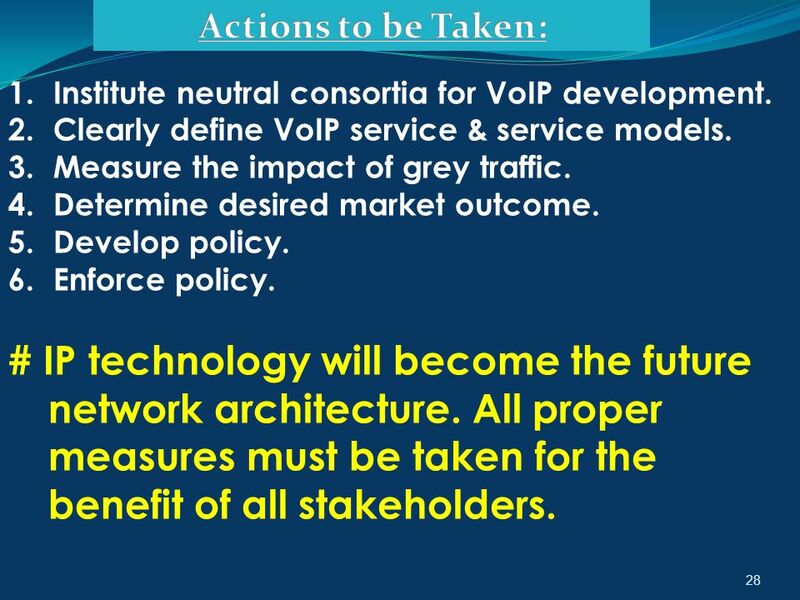  Current policy does not officially ban VOIP in Operators’ core networks.  Permitted in private networks.  Wide-spread gray market. 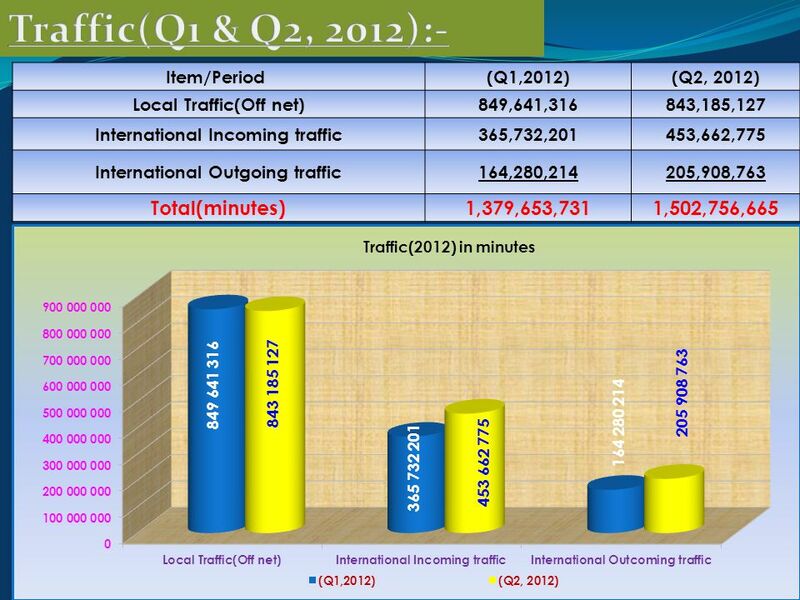 23 23  Appreciable international traffic volume routed via VOIP. 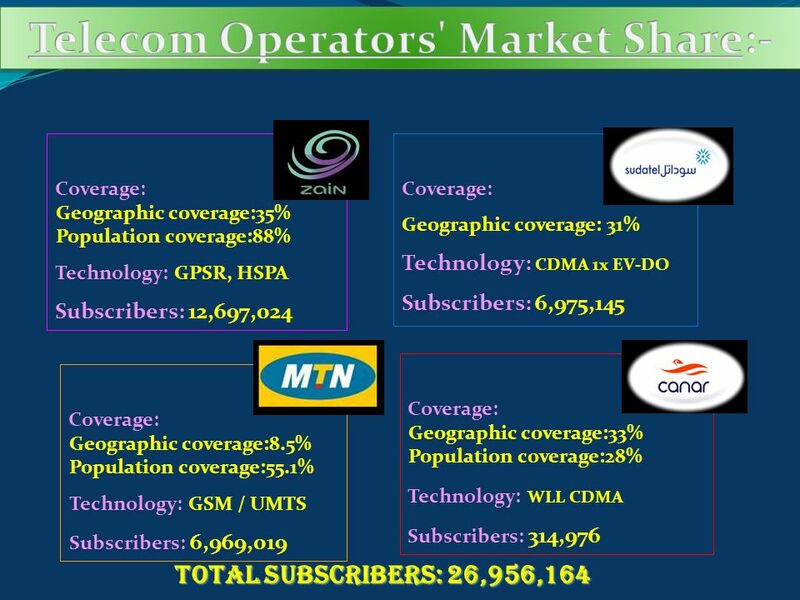  Telecom sector income (hard cash) drops significantly.  International calls Prices are low compared to legacy calls, depriving the national economy from sizable hard- currency revenues.  Presumably will have an affect on NTC reputation in local, regional and international organizations and institutions. 25 25 1) Issue 2 types of licenses for VoIP Gateways:-  Intra-gateway(Individual-authorization license), and  Inter-gateway(General-authorization license. 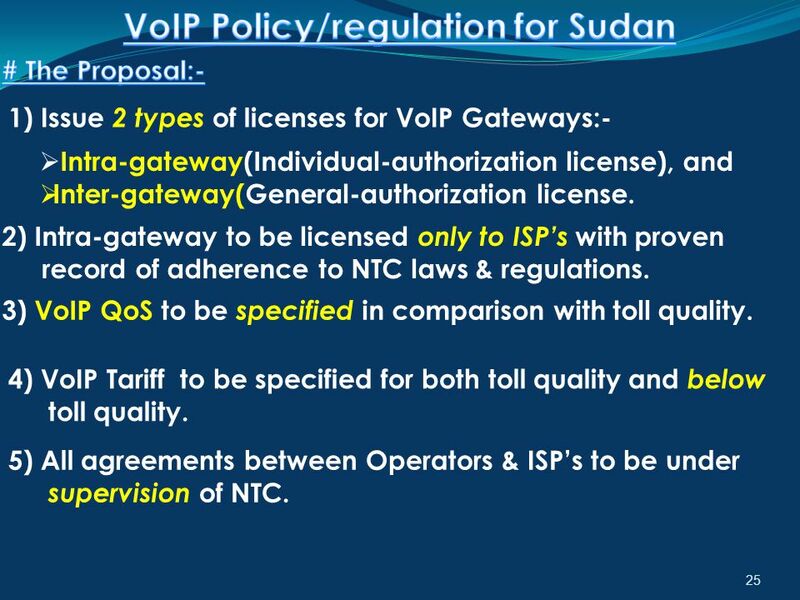 2) Intra-gateway to be licensed only to ISP’s with proven record of adherence to NTC laws & regulations. 3) VoIP QoS to be specified in comparison with toll quality. 4) VoIP Tariff to be specified for both toll quality and below toll quality. 5) All agreements between Operators & ISP’s to be under supervision of NTC. 26 26 1) Terms of Reference(TOR) for General Authorization and Individual Authorization be clearly stated & immediately issued. 2) VoIP license should be restricted to ISP’s only. 3) Intra-gateway license should not be awarded to Mobile & Fixed phone operators, to ensure government attains its full share of telecom revenues. 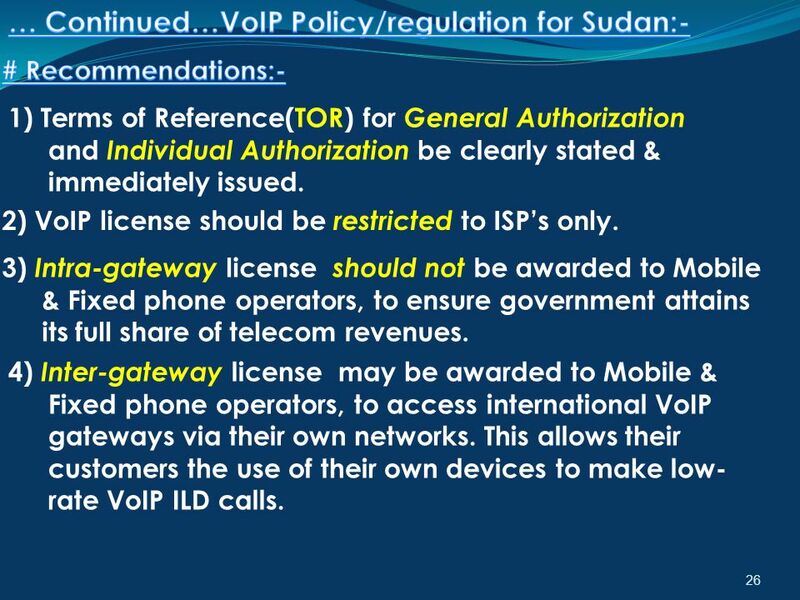 4) Inter-gateway license may be awarded to Mobile & Fixed phone operators, to access international VoIP gateways via their own networks. This allows their customers the use of their own devices to make low- rate VoIP ILD calls. 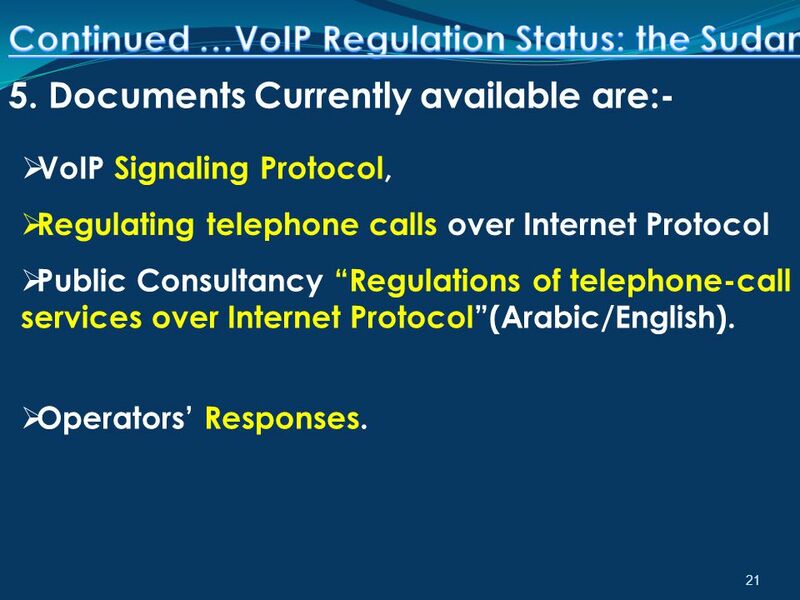 27 # Regulating phone calls via Internet protocol (VoIP) requires concerted, relentless efforts by all stakeholders. # A few steps to be taken are below: 1.1 st Brain Storming meeting:(NTC Staff). 2.2 nd Brain Storming meeting :(Operators, ISP’s,…). 3.Assistance request: (ITU, ATU,VoIP experts). 4. VoIP Regulatory commission: Experts in Law, Economics& Eng., 5.VoIP commission mission is as follows: * Device a VoIP Regulatory Framework. * Put clear rules for VoIP Interconnection. * Recommend a globally-proven Tariff Model. 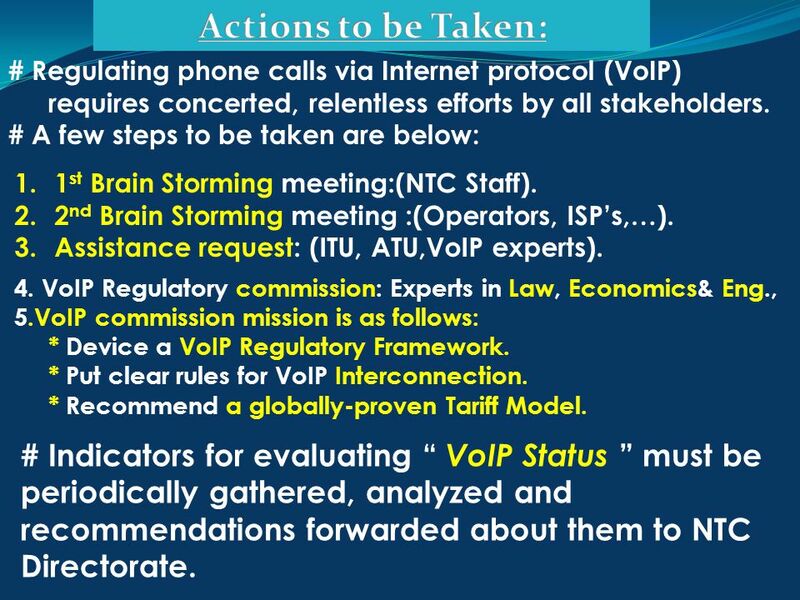 # Indicators for evaluating “ VoIP Status ” must be periodically gathered, analyzed and recommendations forwarded about them to NTC Directorate. 28 28 1.Institute neutral consortia for VoIP development. 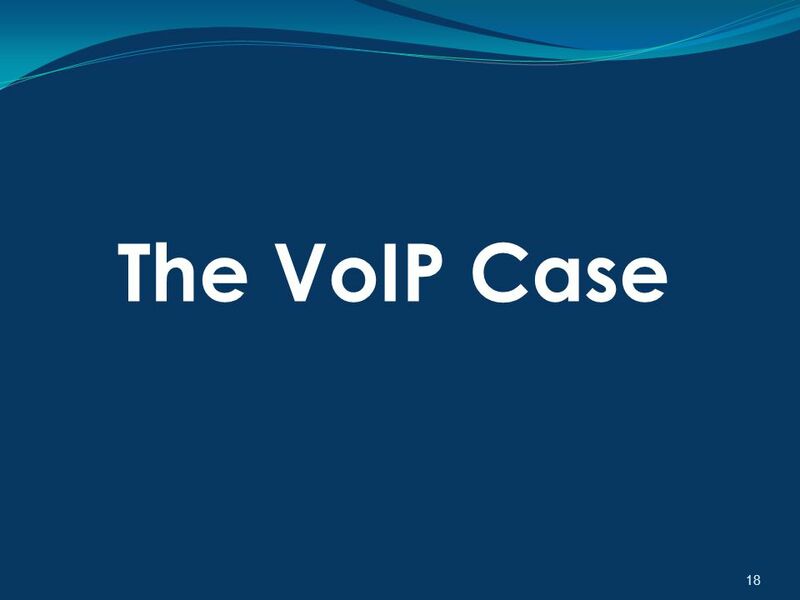 2.Clearly define VoIP service & models. 3.Measure the impact of grey traffic. 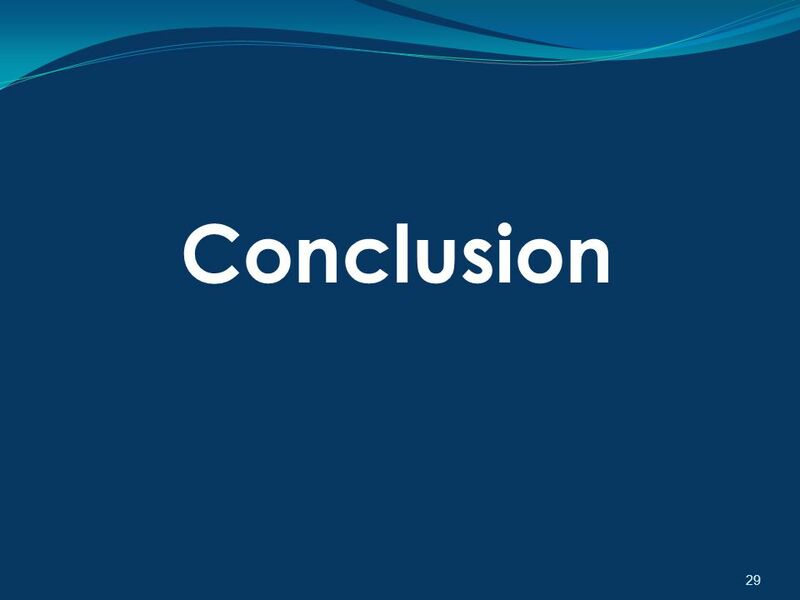 4.Determine desired market outcome. 5.Develop policy. 6.Enforce policy. # IP technology will become the future network architecture. All proper measures must be taken for the benefit of all stakeholders. 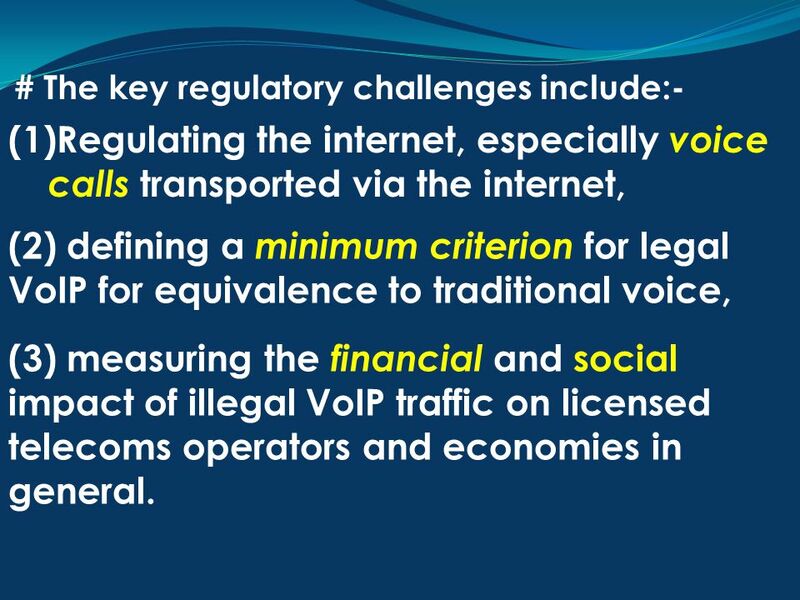 30 (1)Regulating the internet, especially voice calls transported via the internet, # The key regulatory challenges include:- (2) defining a minimum criterion for legal VoIP for equivalence to traditional voice, (3) measuring the financial and social impact of illegal VoIP traffic on licensed telecoms operators and economies in general. 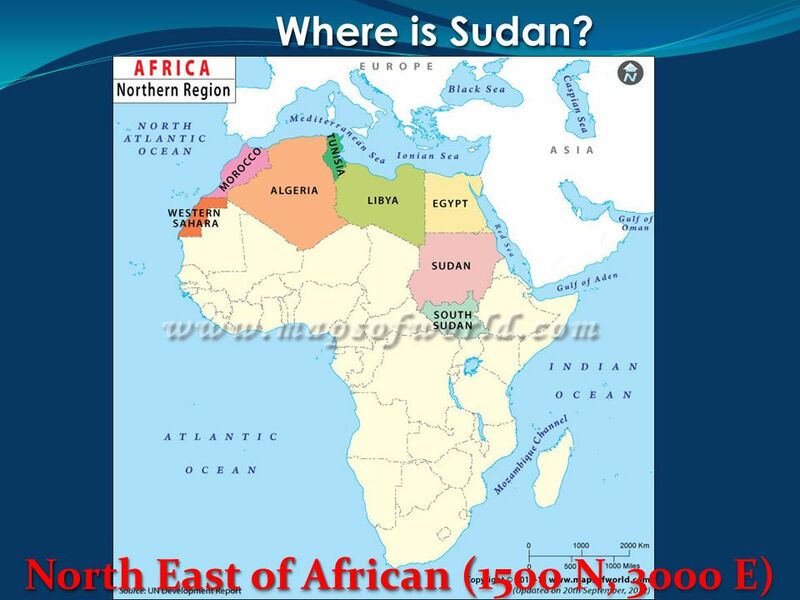 Download ppt "Where is Sudan? 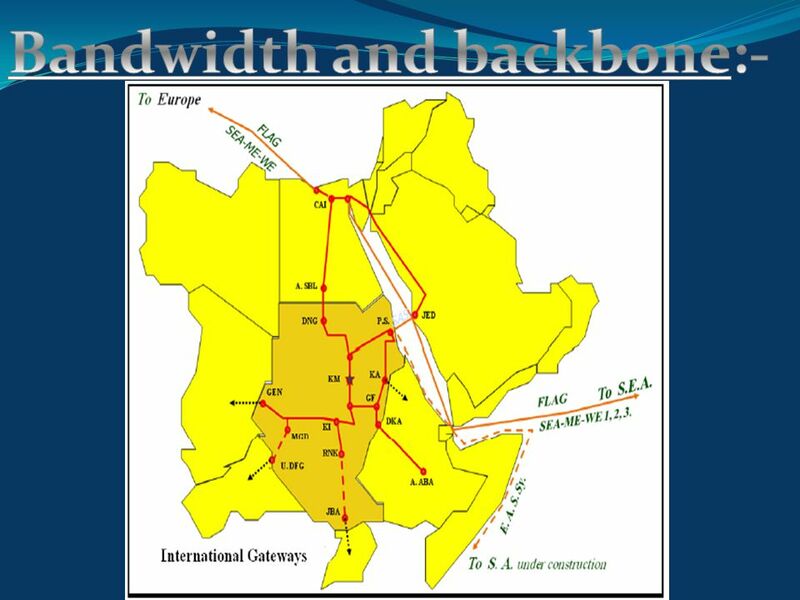 North East of African ( North East of African (1500 N, 3000 E)"
Internet Policy in South East Asia Internet in South East Asia Bangkok, 21 – 23 November 2001 The views expressed are those of the. “The Internet in South East Asia” Sam Paltridge, OECD Organized by the International Telecommunication Union (ITU), hosted by the Post and Telegraph. 1 All rights reserved © 2001, Alcatel, Paris. Information Document 7-E ITU-T Study Group 2 January 2002 QUESTIONS:ALL SOURCE:TSB TITLE:TELECOM NETWORK. 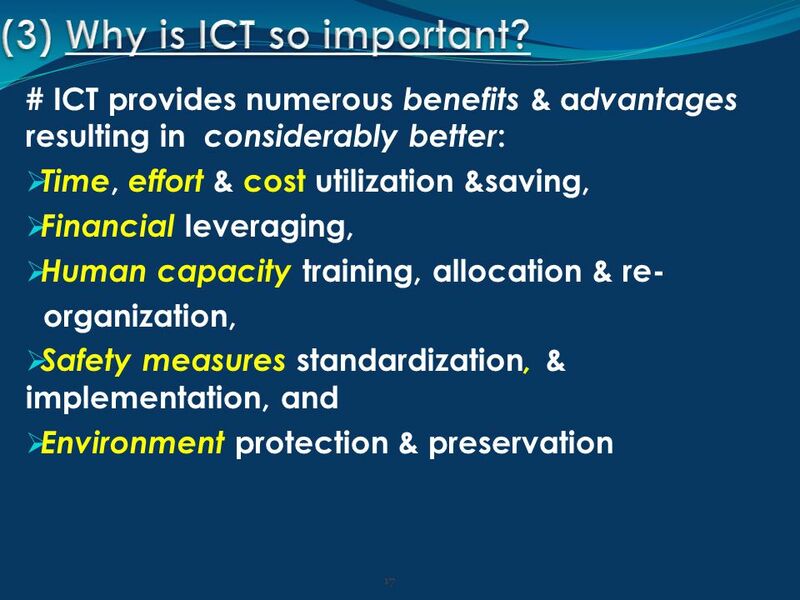 1 Measuring ICT4D: ITUs Focus on Household and Individual Market, Economics & Finance Unit Telecommunication Development Bureau. Gender Perspectives in Introduction to Regulation Gender Module #1 ITU Workshops on Sustainability in Telecommunication Through Gender & Social Equality. 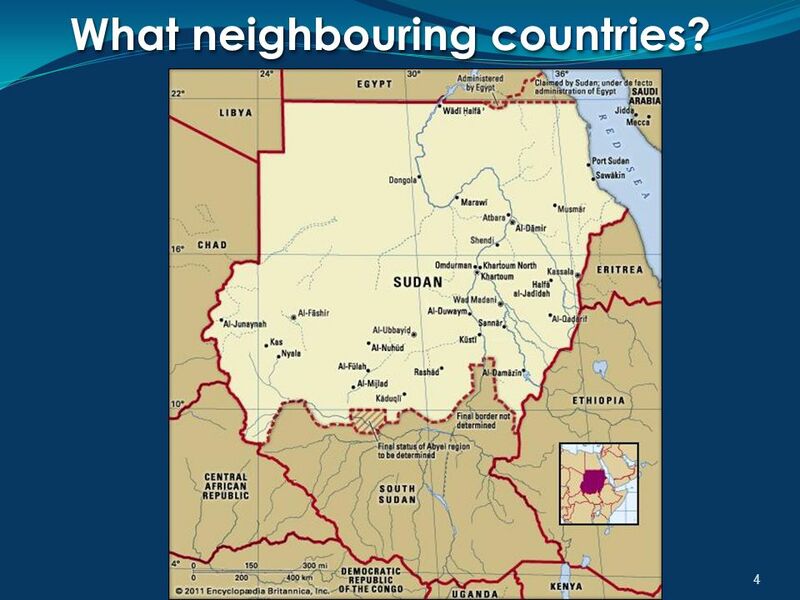 CoE/ARB Workshop On Infrastructure Sharing and LLU Session 4 Infrastructure Sharing Drivers and Blocks By: Isabelle Gross Khartoum – Sudan, 27 – 29 March. CONTROL AND NAVIGATION: PEOPLE SEARCHING TO REACH THEIR GOALS IN AN EVER MORE (IN)FLEXIBLE WORLD Mobile Phone Politics in Sudan the companies and relation. Measuring Arab Region’s Information Society The Fifth Annual Meeting on Telecommunication Development in the Arab Region Beirut (Lebanon), 28 – 31 May. MEASURING NAMIBIA’S TECHNOLOGICAL READINESS by Sammeline Felix 28 November 2013. ORG. ENTITY GSM WIFI VIRTUAL SERVICE NETWORK. Support for wired and wireless networked workstations Wireless PDAs Integrated GPS VoIP Integrated Video. Transitional Demands on Regulatory Resources and Focus The Trinidad and Tobago experience A Presentation at the World Bank Conference on Aligning Supervisory. 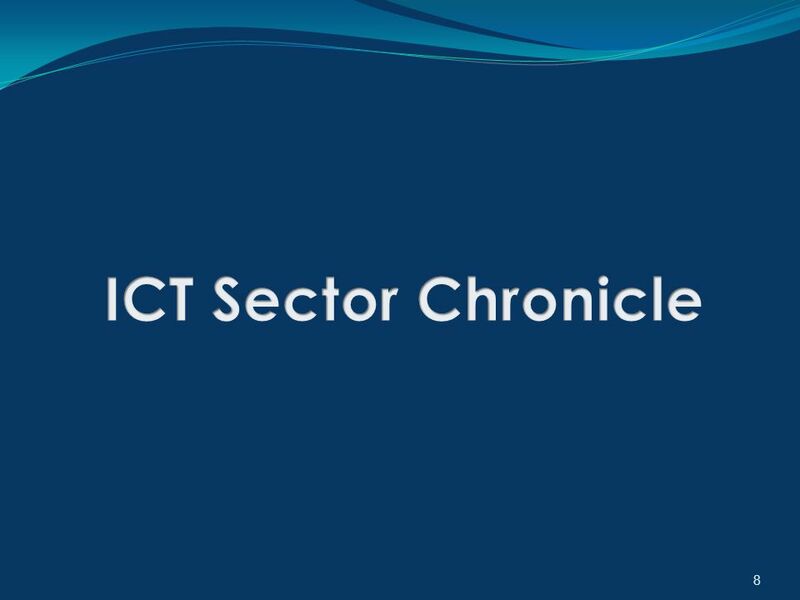 Mobile Technology And Cyber Security K. N. ATUAHENE Director, Domestic Trade and Distribution Ministry of Trade and Industry. NTRA National Telecom Regulatory Authority NTRA Telecom Market in Egypt.  Background  Why the ITRs are important  The need to revise the ITRs  Preparatory process  Some key proposals  Expectations for WCIT-12. 8/14/2015 SMS Exchange: Mobile credits as an electronic payment channel. Case of RWANDA Jean Pierre NSHIMIYIMANA Rwanda Utilities Regulatory Agency & Independent. Gints Zeltiņš Commissioner of the Public Utilities Commission of Latvia Multi-sectoral regulator: Public Utilities Commission of Latvia.